Among the many offerings included in our fixture coordination services, we have developed methods to streamline the pick, pack, and ship process. Not only does this facilitate easy in-store unpacking and installation, but it also allows for efficiencies within the warehouse as well. Assembling the fixtures and graphics on the department walls is where all the planning and preparation come together to bring the brand’s vision for displaying their products in an appealing and eye-catching way to fruition. In-store, it starts with the pallet of fixtures. Several departments within the brand, retailer, and fixture manufacturer are involved in creating these separate data assets and the needs and files change frequently. A detailed, robust, database is the only way to ensure a consistent, repeatable process. In addition, the relational database schema allows us to combine all the necessary information to build kitting instructions for pallet assembly by the fixture manufacturer. 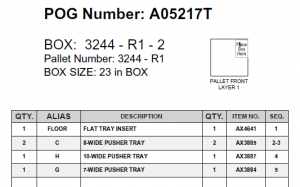 HRG also designed an integrated box label and pick slip to replace the previous report and separate label. The integrated solution reduces errors caused by misplaced pages, and reduces training needed in the pick and pack process. The pallets are built so that the items that will be used first in the assembly in-store are the first accessible and the rest of the pallet is organized in the same manner. This makes it extremely easy for the staff installing the fixtures because they are unpacking the pieces in the order they will use them, eliminating the potential for time-consuming confusion. Our processes have the potential to reduce shipping and packaging costs as well as assembly labor and time in the stores. One client realized a 40% labor savings in their pick and pack process! For more information or to discuss, contact us.